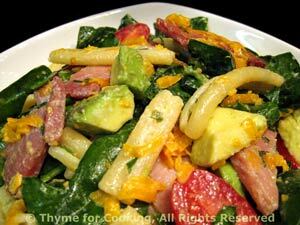 Spinach Salad, with Ham, Avocado and Pasta, a main course spring salad. Place mustard, vinegar and yogurt, in a small bowl and whisk to combine. Sauté the ham if you like, set aside. Wash spinach if needed and spin dry. Sort through the spinach, discarding any damaged leaves, cutting the large leaves in half.